Donald Cerrone almost called off today’s UFC Singapore main event. The veteran UFC fighter, who will likely be inducted into the UFC Hall of Fame at the end of his storied career, said he was very close to cancelling his scheduled fight with Leon Edwards just hours prior to today’s event in Singapore. 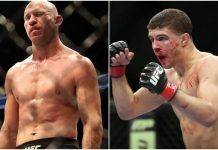 Cerrone said he had been throwing up from the time he woke up on Saturday morning right up until the late afternoon, just hours ahead of his bout with Edwards. “Cowboy” would ultimately suffer a hard fought unanimous decision loss to Leon Edwards in today’s UFC Singapore main event (48-47 x3). Donald Cerrone, who is now 35 years of age, has now gone just 1-4 over his past five fights. With that said, “Cowboy” has no plans of calling it quits. In fact, the popular former UFC lightweight title challenger hopes to fight at least two more times before the end of the year. Who would you like to see Donald Cerrone fight next? Sound off PENN Nation!